Francis Swaine is listed as a messenger in the 1735 Commissioners of His Majesty's Navy. Although we do not know how he came to be a marine painter, he was a close contemporary of Charles Brooking. He was also strongly influenced by the work of his father in law Peter Monamy, especially in his treatment of studio calms. This is why his work has been mistaken for both these artists' as well as that of John Clevely. On the whole Swaine liked to paint general shipping subjects, often on a small scale. He also took commissions for actions. Swaine exhibited at the Free Society exhibitions from their inception in 1761 until the end of his life and had put aside seven pictures for exhibition in 1783. His work appeared from 1762 to 1783 at the Society of Artists exhibitions. He died in London in 1782. Swaine is well represented in museum collections throughout Britain including those of the Victoria and Albert Museum, London and the National Maritime Museum in Greenwich. Designed and built at Chatham under the direction of Sir Phineas Pitt, great nephew of the builder of Charles I's fabled Sovereign of the Seas, the Prince was one of the three first rates dating from 1670, all of which were laid down to replace the capital ships destroyed or captured by the Dutch during their infamous raid on the Medway in June 1667. Prince was measured at 1,395 tons and was 167 feet in length with a 44 3/4 foot beam. Mounting 100 guns, she was a powerful as well as handsome vessel and was first commissioned in 1672, on the outbreak of the Third (and last) Anglo-Dutch War. Her lieutenant - later her captain - Sir John Narbrough called her 'a great and brave-contrived ship' and found that she 'wrought very well in staying and bearing up, and steereth mighty well'. 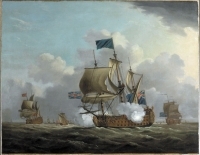 Throughout the Third Dutch War (1672-74), Prince acted as flagship for several high-ranking officers including the Duke of York, the King's brother and the future James II, and thereby attracted the enemy's special attention. 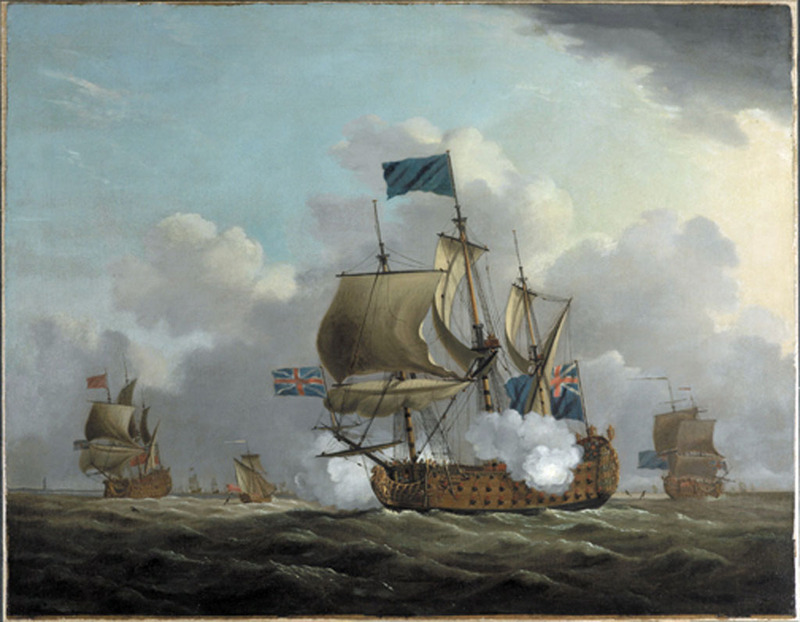 At the battle of the texel (11th August 1673) she was subjected to a particularly determined assault by a group of Dutch ships and barely avoided destruction in what proved an epic defence that soon became the stuff of legend within the Royal Navy.